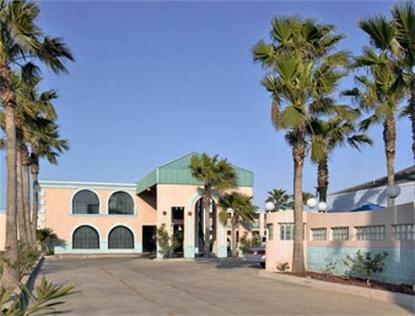 Located across the Queen Isabella Causeway on the Southern-most tip of Texas near Brownsville, Ramada - South Padre Island welcomes you with pristine white sandy beaches, beautiful sunrises over the Gulf of Mexico and breathtaking sunsets on Laguna Madre Bay. The Ramada Limited, where all year long you can get our PACKAGE RATES, is well situated right in the middle of the Island. Before your morning walk to the beach, a mere block and a half from the hotel, stop by the Lobby Cafe for fresh brewed coffee and a hot Belgian waffle served with a complimentary USA Today newspaper by the owners and staff with a welcoming smile. The Ramada provides spacious guest rooms with new Concierge Series mattresses, new citrus ginger amenities, cable TV with over 70 channels, WIFI and data ports, refrigerator and microwave. The hotel also features non-smoking rooms, suites with private hot tubs, luxurious king-bedded rooms as well as two Queen-size bed rooms and special accommodations for physically challenged guests. Park-at-your-door convenience saves precious moments to enjoy South Padre Island. Enjoy the Ramada - South Padre outdoor enclosed swimming pool and hot tub, or relax and retreat at an umbrella table or lounge with a good book. The hotel provides a hospitality meeting room that will accommodate up to 16 people and is complimentary when 10 rooms are reserved. A coin-operated laundry center is located on each level of the hotel. AAA and AARP membership Senior rates are provided for our Winter Texans and pets are welcome for a small daily fee. Join us on South Padre Island for your year-round beach, windsurfing, water sports, fishing, birding, horseback riding, beach combing, sand castle building and kite flying - all just a few minutes' walk from your guest room door to the sands of the Gulf and Bay. As the sun sets, choose from over 70 restaurants, clubs and lounges where the famous Bay shrimp and Texas beef or fabulous regional cuisine are served in high style or a great casual setting. Matamoros, Mexico is only 30 minutes away for great shopping, fiesta-style fun and a taste of Old Mexico. Credit Card required, cancellation policy is 24hr prior to 4:00 PM General Policy for this hotel except: Credit card required, cancellation 7day prior to 4:00 PM 3/7-3/22 Spring Break/Security deposit 250 US dollar at check in for Spring Break. Credit card or Cash only. Credit card required cancellation is 72hr prior to 4:00 PM for 2007 dates: 10/11-10/13, 11/22-11/24, 12/21-12/31 and 2008 dates: 5/22-5/25, 7/1-7/31, 8/29-9/1, 10/16-18, 11/27-30, 12/19-1/3/09.